It’s always a bit of a challenge to think of something special that my Godparents will really love for Christmas. Of course, they have been wonderfully gracious about every present I have ever given them (even though I’m fairly sure they have had some proper tat over the years), but this year I simply haven’t been inspired by what I’ve seen in the shops or on the internet. 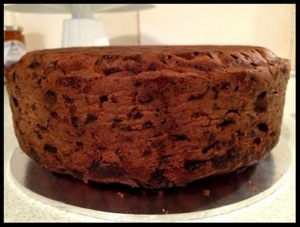 Instead, I decided to bake them a Christmas Cake. 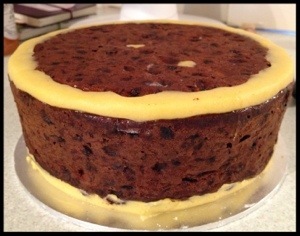 Being a selfish baker who – until recently – only baked things I enjoy myself, I’d never made a fruit cake before. As a PR, I have – literally – heaps of Christmas magazines kicking around, so I trawled through them all until I found a recipe I fancied: Paul Hollywood’s Christmas Cake recipe, which I discovered in the pages of Woman&Home. Now, I hesitate to make the point I’m about to make, largely because it’s the kind of comment that makes me feel middle-aged before my time (I am, after all, a spring-chicken-like 32), but I can’t quite stop myself… My point is that there really should be some collaborative discussion between recipe writers and supermarkets: one asks me to use 115g blanched almonds; the other sells blanched almonds in packets of 100g. Hurrumph. 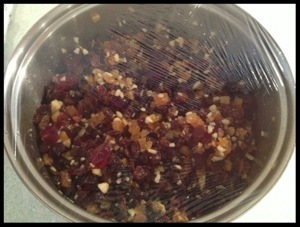 First, I measured out all the delicious dried fruit and nuts, chopped the bits that needed chopping and soaked them in brandy and orange juice. As I was baking this at my Mum’s house, there wasn’t a mixing bowl big enough to accommodate such copious volumes, so a big saucepan was drafted in as an emergency measure, until I could borrow a huge bowl from a friend. Then I followed the instructions, except the tin was slightly too small in all directions so I made an extra little loaf. 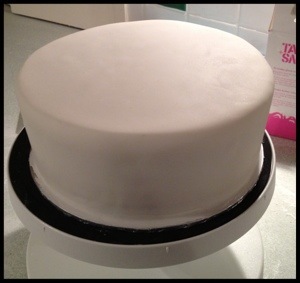 This was the final cake, ready for marzipan and icing (complete with weird shape where the tin has a ridge in the base). But it needed a little hole-plugging due to aforementioned weird ridge, compensating for the domed top (which became the bottom) and some holes made by errant currants. I marzipaned using Paul Hollywood’s method: one disc for the top and two strips for the sides, stuck on with warmed apricot jam. 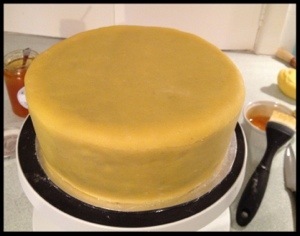 I rolled out the icing, brushed the marzipan with cooled boiled water and draped it over the cake. 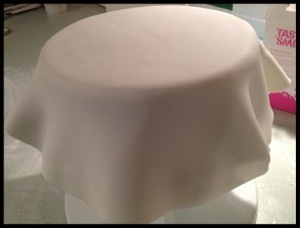 I used my hands to smooth it first, then one of those clever smoothing paddles, before trimming the edges with a sharp knife. I found some gorgeous little star-shaped icing cutters, which include a plunger mechanism to release them. 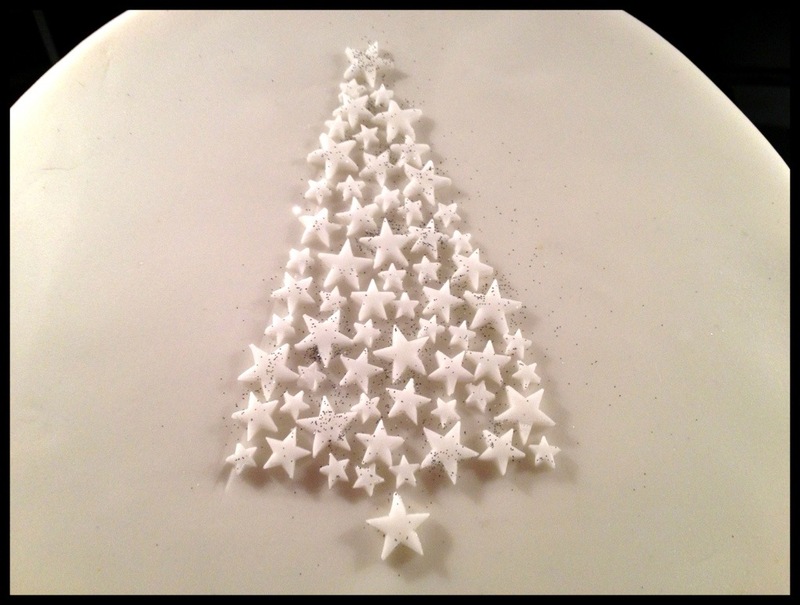 So after I cut each one, I painted it with a little water and used the plunger to apply it to the cake in the shape of a Christmas tree. A quick dusting of silver glitter, a good red ribbon and my gift is complete. 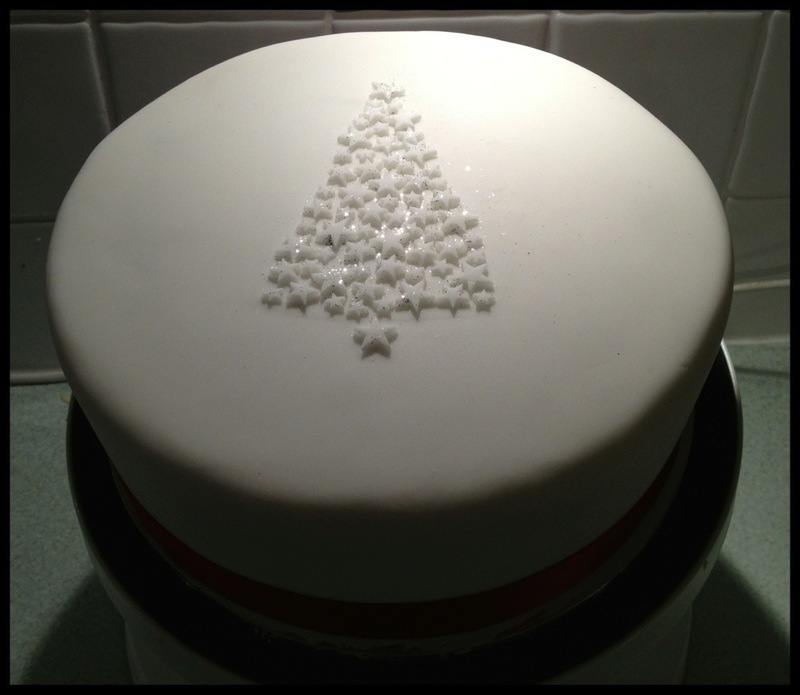 This entry was posted in Cooking & Baking and tagged Christmas Cake, fruit cake, Iced Christmas Cake, rolled marzipan, rolled Royal icing by wordspicturesandcake. Bookmark the permalink.